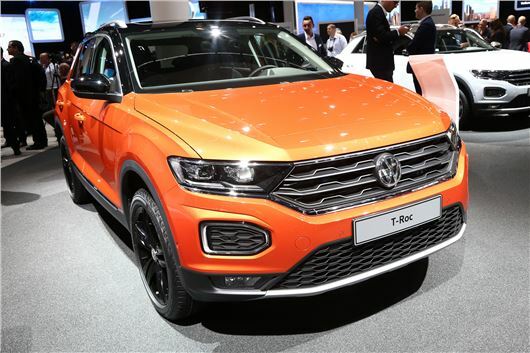 Volkswagen’s new T-Roc crossover has been revealed at the Frankfurt Motor Show. The SEAT Ateca and Nissan Qashqai rival will go on sale in late 2017 with prices starting in the region of £18,500. Click above to see a video overview. Powered by a range of four-cylinder petrol and diesel engines, the Volkswagen T-Roc will be 252mm shorter than the Tiguan, at 4.2 metres long, while many of its mechanical underpinnings will be shared with the Ateca. Like the SEAT, the diesel engine line-up will consist of 1.6 and 2.0TDIs, with power ratings spanning from 115PS, 150PS and 190PS. The turbocharged petrol range will feature three TSI engines - 1.0, 1.5 and 2.0-litre - with outputs starting at 115PS for the three-cylinder unit and rising to 150PS and 190PS for the larger four-cylinder engines. There are no details about emissions or fuel economy, but the 115PS petrols and diesels will be front-wheel drive and feature six-speed manual transmissions as standard. The 150PS and 190PS units will get the option of 4Motion all-wheel drive and a seven-speed DSG auto. Like the Up city car, the T-Roc will get a huge array of personalisation options, with coloured dashboard inserts, contrasting roof colours and ambient lighting. A 6.5-inch touchscreen will dominate the minimalist dashboard, while Volkswagen's latest eight-inch touchscreen infotainment will be available as an option, with DAB audio and navigation. Volkswagen's digital instrument display will also be available, allowing the driver to add maps to the background of the instrument binnacle. Bootspace will be a useful 445-litres when the rear seats in place - 15 more than the Qashqai - while the 60/40 split rear seats will fold down to provide 1290 litres, which is significantly less than the outright 1585 litres you get in the Nissan. Entry-level T-Roc models will get LED daytime running lights, DAB audio, Bluetooth and 16-inch steel wheels. The mid-range Style trim will add coloured 17-inch alloy wheels, full smartphone connectivity and a broad choice of personalisation options, while the halo Sport models will add front fog lights, red brake callipers and tinted glass. Active safety kit levels will be high, with all getting automatic emergency city braking with pedestrian monitoring and lane keep assist. High spec versions of the T-Roc will get adaptive cruise control, rear view camera and blind spot monitoring. Volkswagen's Rear Traffic Alert will also be offered, with the system warning the driver and/or applying the brakes if it detects a potential impact when reversing out of a driveway. I think this will be a good seller for VW but as usual you have to pay big money for a decent spec , which in reality makes no difference when it come to trading it in a few years down the line . The likes of KIA Nissan ect are right up there now as far as quality and more so with aftersales service and their cars do come well loaded up with things that VW charge a small fortune for. Even so i recon this will be a big hit as i think it looks great . So if this is a SEAT Ateca competitor, it must also be competing against VW's own Tiguan?